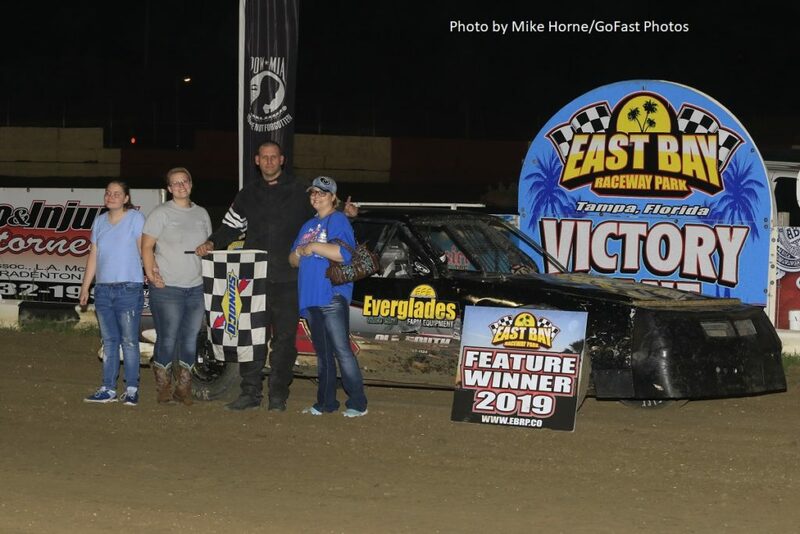 The fifth night of racing action in the 2019 regular season at East Bay Raceway saw some different faces gather in Victory Lane, including two first time winners. The crown jewel of the night was the running of the Jody Robbins Memorial for V-8 Warriors. The 25-lap main was advertised as a race that offered $400 for the winner, but local businesses and sponsors stepped up to double the top prize. Additional monies were offered for special awards. Tommy Hill of Clewiston grabbed the lead on lap 3 from early leader Jason Burnside. Hill took advantage to move out to a steady four car length lead throughout the early stages of the main. Meanwhile, action behind the leader was intense. On lap 10, two top five cars collided, resulting in Burnside and Nick Brown headed to the rear. Gary Lucas had made his move to get to second at that point and Lucas would hold off Scott Bane for the right to chase Hill. A hard collision into the frontstretch wall by Derek Gray brought the caution back out. A few laps later, Bane was able to move to second, but hard luck hit when he spun while negotiating turn two. That mishap moved Raymond Vann into the runnerup spot from his 14th starting position. Lucas slowed on a subsequent restart, ending his challenge and putting Burnside back into the top three. A frantic battle on the next restart shuffled the field behind Vann, who became the lone challenger for Hill. Vann could not close the gap and Hill sauntered home with the victory, his first of the season. Vann received the prize as Hard Charger while Gray was selected for the Hard Luck Award. Hill picked up an additional $100 for leading lap 6. Hill, Kalen Maynard and Jeremy Simpson were heat winners. Young racer Megan Rae Meyer claimed her first feature win in taking the top spot in the Late Model Sportsman 15-lapper. Meyer took the lead from early leader Tanner Cobb on the tenth lap and held off the charges of Jason Pope and Forrest Gough for her victory. Gough won the preliminary event. Tim George ran a consistent line from start to finish in the Q Auto & Injury Attorneys Sprint main for the first feature in the class for 2019. The 2010-2011 track champion, who makes only occasional starts, claimed his first victory since September 17, 2016. Robbie Smith and 2018 track champion Joe Zuczek, who was honored at intermission, started their night with heat wins. Kyle Bowman recorded his first career feature in the Studio Red Salon Gladiators, holding off older brother Daniel to claim the night’s finale. Kyle took the lead from a determined Logan Casteel and then managed to keep his brother, the two-time defending champion of the class, in a position behind him. The feature win backs up a heat race win earlier this year for Kyle. Ricky Rutledge Jr. and Daniel Bowman won heats. It was a bit of a wild night for the Micro Sprints, who opened the program. Before a lap could be completed, two cars made contact with Jerod Meyers flipping. The driver was not injured, but the car was done for the night. In the main event, contact between Brian Baxter and Corey Dyal saw Dyal’s car do a complete flip in the air and land back on all fours. With a push from behind the car was able to continue in the feature, but dropped out a few laps later. Larry Rarer recorded his third feature in as many tries, bringing home the 15-lap main. Rarer and William Brannan posted heat wins. The East Bay action heads into the month of April with the headline attraction of the Donnie Tanner Memorial 50 for Pro Late Models presented by Stingray Performance. Joining the Pro Late Models will be Street Stocks, Wingless Mini-Sprints, V-8 Warriors, Studio Red Gladiators and, for the first time in 2019, Mod Lites.